Wash and clean your cranberries – remove any stems, leaves, grit. Allow them to dry on a towel. Wash and sterilize your mason/infusion jar. Create simple syrup from the sugar and the water by boiling them just until the sugar dissolves completely. Then allow this to cool. Put the cranberries into your food processor and pulse until they are the consistency of small pebbles. You want them small but you don’t want a puree so don’t over process. Put your ground up cranberries into a cheesecloth bag and then into your infusion jar (mason jar). Make sure you tie your cranberry “pebbles” securely in the cheesecloth so when you shake your infusion it won’t come open. Zest your lime making sure not to zest into the bitter white rind. Add the lime zest to your infusion jar. Pour in your simple syrup mixture. Add your vodka, stir and close your lid securely. Store in a cool, dark place for a minimum of one week and up to four weeks, the longer the infusion time, the stronger the cranberry flavor. Gently shake the mixture every day if possible, don’t open the lid, just shake. Grab your 3 quart bowl with the pour spout, place your large strainer over it and line the strainer with 2 or 3 layers of cheesecloth. Open the mason/infusion jar and remove the bag of cranberries. Hold it over the jar to let any precious liqueur drip out then toss it. Pour the unfiltered cranberry liqueur into your cheesecloth lined strainer but don’t over pour so it flows over the straining set up. You might have to do this in several steps. Empty the strained liqueur into your other glass bowl and cover while you process all the unstrained liquid - if your strainer is sitting in liquid it’s not straining. Once all your liquid has passed through the first filtering process, pour it all back into your bowl with the spout and you’re ready for the final filtering step. This is where that nice bowl with handle and spout will come in very handy. Set your funnel into the decorative bottle’s neck. Line the funnel with a coffee filter – you can use 2 filters but the drip will be slower. Slowly pour the liqueur from the bowl into the funnel, stopping well below the top of the coffee filter. You will do this again and again until all the liquid has been filtered again so be patient. Cover your glass bowl with saran wrap or a lid while you're filtering to keep out debris and stop any evaporation as each fill up filters through. It might look like it's stopped after a few seconds - just walk away and do something else for a bit and it will all filter though. You can then pour some more in. I'll change filters after a couple of fill ups. Cap off each bottle as it’s filled and go to the next until finished. This will take some time to filter all 8 cups but you’ll end up with a much clearer end product by this double filtering method. Let your bottled Cranberry Liqueur rest for another few days. This will deepen the flavor and mellow out the liqueur. The longer you rest, the more mellow your liqueur. Your homemade Cranberry Liqueur can be enjoyed for several months to a year depending on how often you open the bottle and it can be stored unopened for up to a year but I doubt it’s going to last that long. I have seen recipes where you can add spices, though I haven’t tried it yet as I generally like to infuse spices at the single cocktail level. This way I’m not as limited in the use of my liqueur. Please start with clean bottles and jars. Wash them and boil them to sterilize. Use glass or stainless bowls because plastic and aluminum absorb flavors. Wear old clothes – cranberries stain like a madman. Yes, you can chop your cranberries with a blender but if it’s a cheap blender you might burn out the motor. 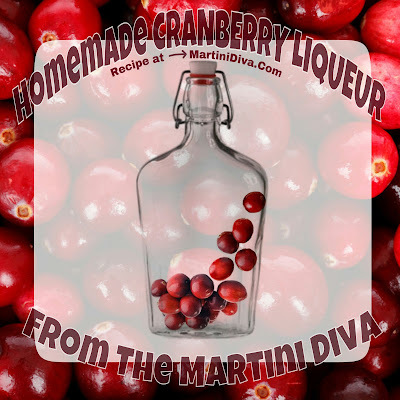 Don’t cut the recipe in half – this is a lot of work and you might as well get as much booze out of it as you can, and you can always give Cranberry Liqueur as a gift!